Ya know guys, I get asked all the time one major question: "Chad, when are you gonna do a blog post on your favorite Batman movie?". Wow. You're right. I just haven't covered it like I've wanted to. When you think about it, there's only so much time in the day, that sometimes we get distracted and lose sight of what's important. And to be quite honest with you, the real reason, I got into blogging was to eventually give this movie it's just due. I know, I know. 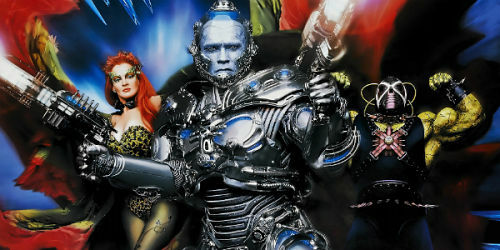 Everyone says it's their favorite superhero movie of all time and it's very easy to see why. 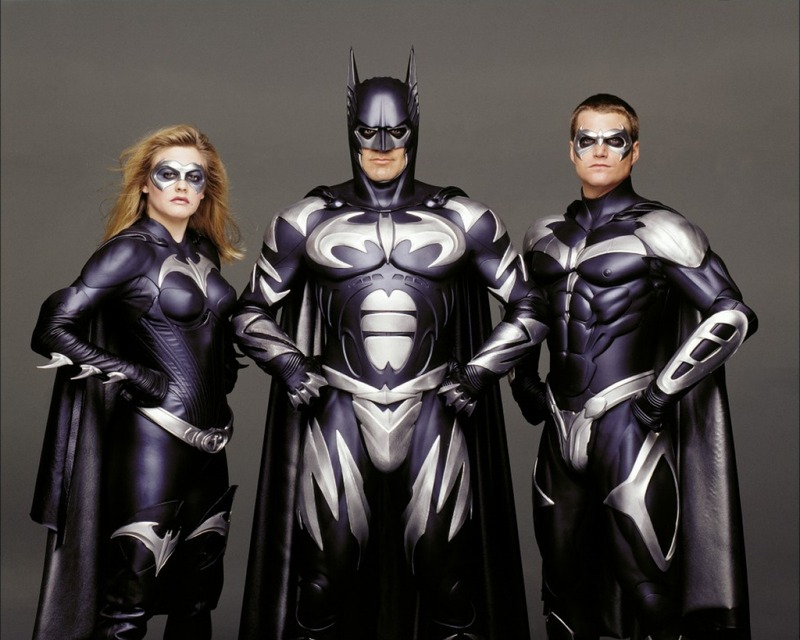 If you were around in 1997, it was the golden age of superhero films. Steel, Spawn, Star Kid, and of course that amazing Justice League TV movie. But one beats them all out. One stands above and beyond as the greatest depiction of Gotham City's finest. One changed all our lives and the superhero game forever. Yes, fans. I must be referring to...BATMAN AND ROBIN. Released in 1997, I was 14 and still on that unbelievable Batman Forever high. In my mind, this movie couldn't fail. The weeks leading up to seeing this in the theater was downright painful. All I could think about Batman and Robin. Everywhere I turned, there it was. Staring me in the face. KB Toys had the toys on their racks, Taco Bell was offering cups and a special promotional giveaway, TV spots, posters, everything...I couldn't take it. Then. My day came. I saw it. In the same theater I had seen the previous two Batman movies. It became an accidental tradition to see any Batman movie in the same place. And let me tell you, after walking out of that theater, I rushed right back to the box office to get myself another ticket. I couldn't believe it. Finally, we got Batman as he was meant to be! I felt like I was in Gotham City the entire time and these characters were almost real! No one phoned in their performance. Not. Once. Let's take a quick look at what is widely regarded as the greatest movie ever released! Oh the joy I heard when they finally decided to get themselves a truly great Bruce Wayne. 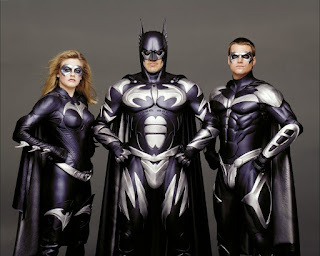 For years, the Batman series had been hampered down by just medium level actors such as Michael Keaton and Val Kilmer who didn't truly understand what it meant to be the Dark Knight. I mean, what kind of line is "I'm Batman"? Come on, WB! We're smarter than that! We deserved an actor who personified humor and the lightheartedness of Batman we all grew up with from the Adam West TV show! Georgie C is the greatest actor of our time who can adapt to any role, so playing the greatest modern warrior, was simple for him. I'm sure the studio was eager to start counting their money even before the movie was released. Robin. Well, I gotta tell ya, wasn't blown away. Even to this day, Burt Ward personified Robin as he should be. Loud, obnoxious and ready and willing to drop his sassy catchphrase "Holy ..." at any moment. Chris O Donnell just played a bland, rebelious teenager. I mean, come on. That's not what Robin was! I wanted to see a cheesy Robin who yelled and screamed and was easily defeated. As great as this movie was, Robin was definitely the low point. But that's ok. I mean, following Burt Ward's footsteps is no easy task. I'll give him credit for trying. Teen heartthrob and logical choice for Batgirl, Alicia Silverstone, was fresh off the success of Clueless and finally landed the role she was born to be. Not since Yul Brynner as a robotic cowboy in Westworld, has there been such a perfect casting. Yvonne Craig totally bored people in the TV series as Batgirl and delivered the most yawn inducing performance I have ever seen. She just put absolutely no effort into the role. But Alicia? She was vibrant, sassy, and let her personally shine through like I've never seen before and the likes of which I'll probably never see again. Whether she was beating Poison Ivy or riding her BatgirlCycle, this is no doubt how Bill Finger imagined Batgirl to be when he created her. Yvonne surely could've taken a lesson or two on what the character truly means with Alicia's dry delivery. Look out, Terrific Trio and make some room for the bad guys! By now, every movie had two villains. Not this one. We got THREE! YES! Finally, WB knows what we want! Let's take a look. 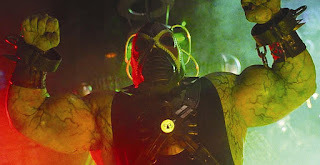 Remember that lamewad Bane from the Dark Knight Rises? The one that just sits around and talks about Wall Street and how bad rich people are? Peee-yuuuu! What a terrible, terrible waste of celluloid! I mean, Bane doesn't talk. He just lumbers around and shouts while he breaks walls and throws things! Jeep Swenson gave that to us in spades. The former pro wrestler put on his greatest performance while he played Posion Ivy's own person Frankenstein. It almost felt like Bane was a real person and could be almost sympathized with. I'm just sad to see him revert back to his skinny nerd after a grueling and almost deadly battle with Robin and Batgirl. But, you win some, you lose some. 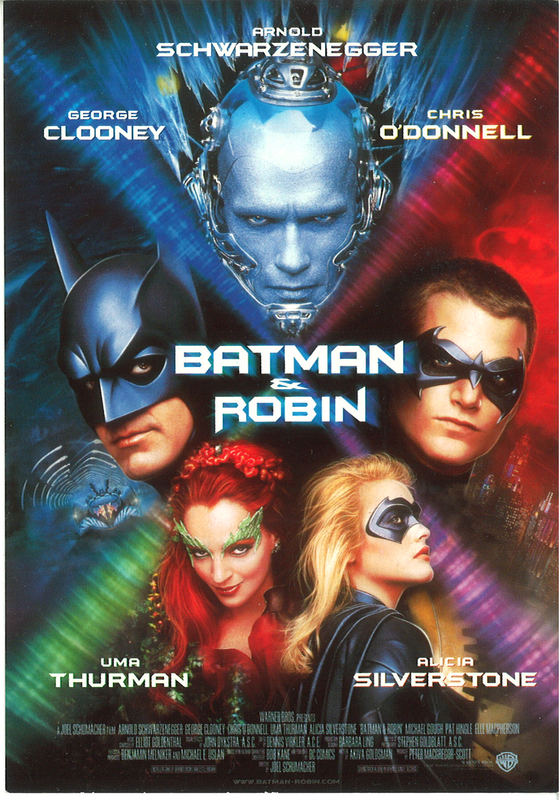 Ever notice how Poison Ivy hasn't been put in any Batman movie since this one? Because they, smartly, decided that no one can truly fit into Uma Thurman's green tights. I don't know about you, but when I think of the seductive villainess, I think of Uma. Gorgeous and smart enough to take over Gotham, one kiss at a time. And that hairdo. Yowza! I know I can't take my eyes off the screen when she waltzes by! Finally, Mr. Freeze. Arnold Schwarzenegger received top billing and rightfully so. 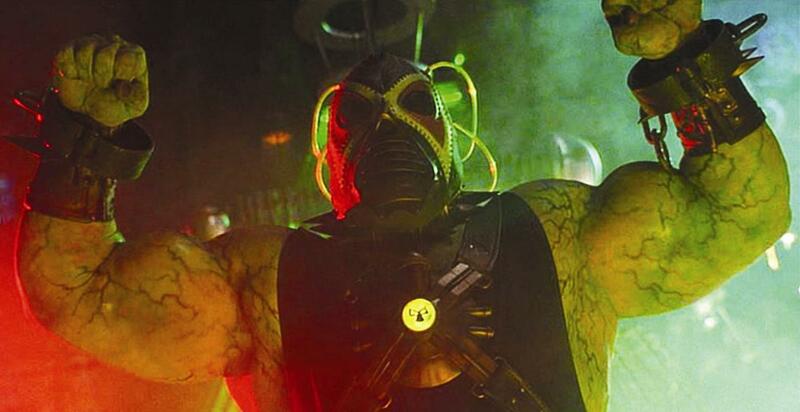 Once again, one of the biggest stars in cinema history and one of the greatest depictions of a Batman villain ever seen. If you can ignore the boring Mr. Freeze from that lame Batman: The Animated Series for a second, as it will just tarnish your image of the cool villain, you'll actually enjoy this. 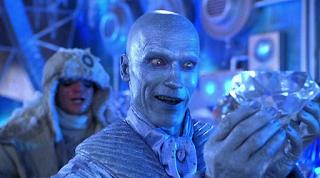 Whether it's his hulking costume, his fantastic accent that I know I always wanted Freeze to have or his hilarious one-liners, I can't imagine anyone ever playing Mr. Freeze again. Arnold owned this role and if we get Freeze in another movie, I demand we get the master of cinema to return to his chilling role. One can only hope. I'm so glad Batman and Robin was made and we're able sit here and discuss the lasting impact of what is no doubt DC's finest hour. I don't know about you, but I feel like sitting down with a big plate of Taco Bell and drink out of my old Batman And Robin cups while watching this classic slice of neon colored cinema! Checking Out DinoDrac's April FunPack! Kicking Off The 2017 Flea Market Season!